Allah is not the same god as Abba since you cannot separate Jesus from the Father and still be talking about the same deity. Allah has no son nor Holy Spirit, Jehovah does. DIFFERENT GODS. Islam says Jesus is “just another prophet”, Christianity says he is God and Son of the Father. Equating the two dieties is both anti-Islam and anti-Christian, just plain wrong and non-scriptural. Consequently one must ask, what exactly is he preaching? A unified, One World Religion? About a couple of years ago I heard about a new phenomenon in Christianity called “Chrislam”. At first I thought it was some kind of new outreach campaign to bring about better dialogue between Islam and Christianity however, when I discovered that it was actually a combining of the two faiths, I was appalled. This is the very same way that we have suffered an amalgamation of Pagen theologies being incorporated into mainstream Christianity. The Christmas Tree for example, is such a blending. The worship of nature woven into the fabric of Christianity. The Easter Bunny, a Pagen fertility symbol that somehow doubles as a symbol for Jesus? The acceptance of female Pastors when the Holy Bible clearly prohibits such usurpation, a heresy designed to facilitate the “Gay Agenda”. Now along comes the latest and perhaps greatest of all blasphemies, Christianity + Islam = Chrislam. A precursor to the False Prophet’s One World Religion. Satan is constructing his kingdom here on Earth everyday, and in every way. Until recently, I had a hard time understanding how this was being done. No longer, since I have discovered Gang Stalking. A world wide gang answering to Shadow Government Illuminati cabals working in collusion with Fallen Angels. That is but one component however. It has long been known by rulers throughout history that a political structure which does not enjoy the sanction of a popular and established religion, is bound to fail. Those who seek power know that first you must associate your politics to align with the people’s beliefs. It is only in this way that the body politic will be able to manifest as a strong and cohesive State. The particular brand of religion is of no consequence, it just has to be the dominant one of the populace. 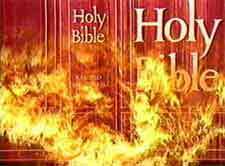 It is for this reason that Satan must first establish a “One World Religion” through his False Prophet before the “One World Government” can be realized. It also has everything to do with free will in that we must choose to follow him but that topic however, is for a future post. Suffice it to say that Satan wants our worship and love just as God does and is the reason that he (Lucifer) will not destroy the Earth. Dead people can’t worship and the dead know nothing. Pay attention, I’m talking two different states of death here, both physical and spiritual death. Anyway…, we now see an active movement towards these ends in many of the “Mega Church” movements of today. Unfortunately, most Christians are stupid and cannot see the deception right in front of them. “…strait is the gate, and narrow is the way, which leadeth unto life, and few there be that find it.” “…wide is the gate, and broad is the way, that leadeth to destruction, and many there be which go in thereat.” This is what will allow one of the last End Time Prophecies to be fulfilled, the Great Apostasy or, “The Great Falling Away”. Misled by the preachings of prosperity, anything goes acceptance (Homosexuality) and false teaching, there will be many stupid Christians who will be ashamed to face Jesus when he finally comes back. They will no longer be virgin brides and will have worshiped the Anti-Christ, mistaking the fake for the real. If you come across any “Christian” minister who says such things as “we all worship the same God” like Doohickie above or, “there are many paths to Heaven” as Oprah Sinbey has infamously said, you should run away from them as fast as you can. They are false and helping to build Satan’s Kingdom here on Earth. Unless you want share in their final wages, you shouldn’t even wish them “God’s speed”. Know what I mean, Dummy? 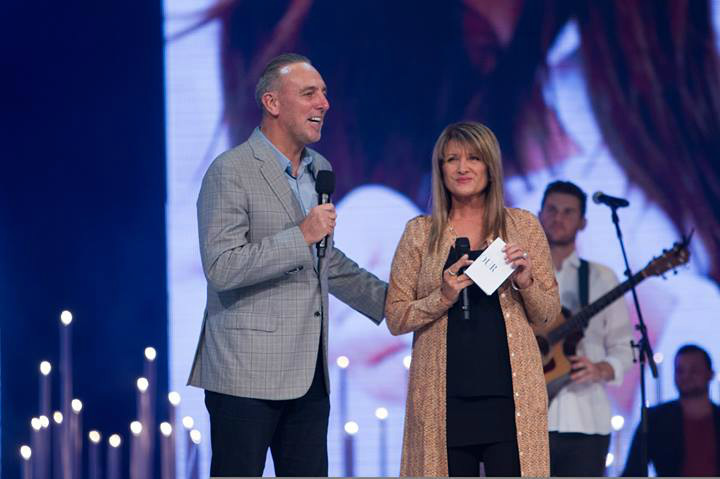 Brian C. Houston and Bobbie Houston, founding pastors of Hillsong Church, appear in a photo shared on Facebook in March 2014. Hillsong Church tweeted a link to Pastor Brian Houston’s statement regarding allegations that he preached ‘Chrislam,’ a blending of Christianity and Islam. “The spirit of the message was exactly the opposite of what some critics are claiming. If you listened to the message in its entirety, my point was that; who a Muslim extremist believes God is, determines what they believe God does, and what they believe God loves,” Pastor Houston insists in the statement, titled “Correction of Misinformation,” which can be read in full below. Houston attributes his remarks about Muslims and Christians serving the same God made during the 2013 sermon, titled “Living for the Master’s Well Done, Part 1,” to a flubbed delivery. He also expressed doubt that critics would accept his clarification. “Those propagating these false statements have taken one sentence from an entire message out of context. I realize that some critics WANT to believe their interpretation, but my prayer is that reasonable people will take my comment in context, accept my acknowledgment that I did not explain this sentence as I intended, and judge me on 40 years of pointing people to Jesus – not one sentence,” explains Houston, who recently joined U.S. megachurch pastor Bishop T.D. Jakes at his annual Pastors and Leadership Conference in Miami, Fla. Critics have been questioning Houston since early last week when videos of his sermon started circulating. Houston’s accusers claim his remarks on Muslims and Christians indicates that the Assemblies of God leader preaches a Gospel other than the Christian one. While Islam acknowledges Jesus as a prophet, the Quran denies His deity as well as His crucifixion, an event essential to the Christian teaching on salvation. Despite other theological conflicts, such as the Christian confession of Jesus as the Son of God, advocates of “Chrislam” insist the two faiths are compatible. Rick Warren, pastor of Saddleback Church in Lake Forest, Calif., also has been denying allegations for years that he practices or promotes the syncretistic teaching of “Chrislam,” a movement which reportedly started in the 1980s. Warren, calling the allegation “a lie that won’t die,” occasionally points concerned supporters to documents meant to clarify his fidelity to the Christian faith. @busterwilson Chrislam is a lie that won’t die. See these 2 links: http://t.co/QK9WHC0Oct http://t.co/IOs0BLyJeG Thx! Hillsong Church, founded in 1983 by Houston and his wife, Bobbie Houston, welcomes about 30,000 worshipers every weekend at 11 campuses scattered around the world, with a 12th in Los Angeles in development. In Australia, Hillsong has six campuses and twice as many extension services. The megachurch, also known for its mega-popular and award-winning worship band Hillsong United, states that its mission is “to reach and influence the world by building a large Christ-centered, Bible-based church, changing mindsets and empowering people to lead and impact in every sphere of life.” The Houstons, whose Hillsong Church is affiliated with the Australian Christian Churches (the Assemblies of God in Australia), have three adult children, also involved in ministry.